Monday saw an interesting evolution of the re-architecture of our core domain at work. As we’ve learned more about our domain, and started feeling the pain from the external layers of our system, James and I have figured that things aren’t quite right. It started off as a realisation that all our apps were too tightly coupled to the database*. 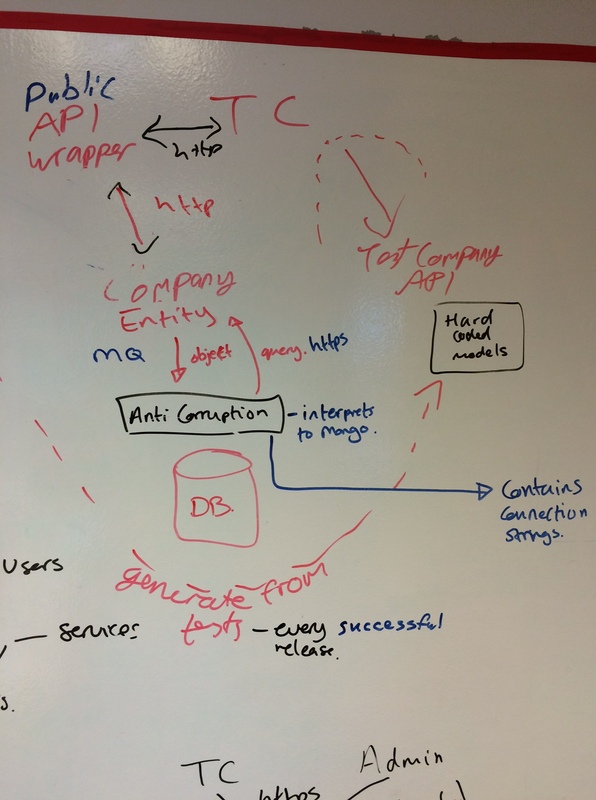 The solution was to put an anti corruption layer around the DB and talk to it over HTTP. WHich we already do with Mongo, but this would be yet another layer of abstraction which would allow us to plug in a different DB provider. Tuesday I spent the morning carrying on this idea and, from home, remotely working with James as the ideas and design evolved. We work together to make important decisions by discussing them, but mostly code alone. Wednesday morning of work and afternoon working on the #xconfmcr talk with the help of James. Unfortunately had to miss CADO. Friday: Macmillan Coffee morning punctuated by some pairing with James where we figured out a new path through the admin system when making quotes. All to do with our better understanding of the new customer entity. Also upgraded our dev VM’s to the latest ubuntu to escape from the newly found Bash vulnerability. We raised about £60 for charity!